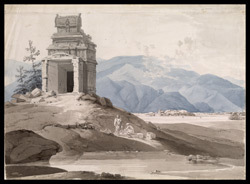 Between March 1792 and April 1793 the Daniells travelled through South India which at that time was still very little explored by the British and admired with wonder the great temples and grandiose sceneries of this part of the country. The Tinnevelly (Tirunelveli ) District, the last phase of their journey south, was ceded to the Company in 1801 and surveys were carried out from 1806 onwards only. At the beginning of the 18th century Tirunelveli was under the control of local chiefs who eventually succumbed to the Nawabs of Arcot. The city was ceded to the British in 1797. Situated on the Tambraparni River, it has an important monument, the Nellaiyappa Temple, which dates back to Pandya times in the 13th century and enlarged in the 17th and 18th century. It tall rectangular pyramidal entrance tower is visible throughout the city. This drawing depicts a temple in a village nearby.